A couple of the joys of small convention that cater to Old School wargaming are Little Wars and Chainmail. The first is considered the first rules for playing with miniatures, a "wargame." Even if it isn't a "tabletop" game, since it was meant to be a floor game. The latter was an early ruleset from TSR that took modern wargaming into the realms of fantasy. I was able to participate in two Chainmail games this year at Gary Con VI but this is the first time I have participated in a Little Wars game anywhere. The first of my two Chainmail scenarios was played on a sand table, essentially a sandbox with legs. These have been around in spirit forever. Or as Terry Kuntz, Paul Stormberg, and Kevin Maurice might put it, at least since Alexander picked up a stick to show his generals what he planned to take next. Certainly, the old school miniatures wargamers of the Sixties used them and there was one in the Gygax basement on Center Street in Lake Geneva then, and a recreation in that basement where we played a Viking/Saxon scenario. 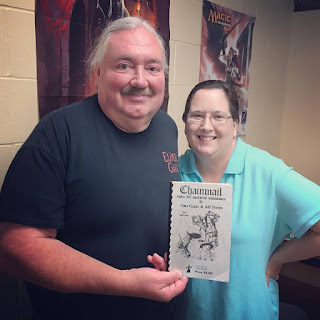 I managed to get in a second game of Chainmail, this time hosted on site at the Lodge and organized by Kevin Cabai, His scenario portrayed the Battle of Sarn Athard, an Elves versus Dwarves ambush straight out of Tolkien. Kevin really sets a fantastic table and it was great fun. Finally, I participated in a Little Wars scenario hosted by John Bobek. His scenario, For Queen and Country, pitted the Bengal Lancers against the Pashtun Tribes. The canon being uses fired ordinance (without gunpowder, of course!) and pieces knocked down had to be removed from the field of play.